The new feature length "Voices in Exile" began with the short "Refugee - An Account." The voice of the Dalai Lama has defined Tibet to the world. Since 1949, Chinese policies have led to the deaths of 1.2 million Tibetans (1/6th of the population) by execution, imprisonment, starvation and forced labor. China's assault on Tibet forced the Dalai Lama into exile in India in 1959. For his insistence on a nonviolent solution with China, the Dalai Lama received the Nobel Peace Prize in 1989. Now 70 years old, the Dalai Lama has spent years gaining allies and respect around the world for his insistence that the Chinese government grant autonomy and respect for his people in their own homeland. With the help of the Indian government and international aid, he has also built a community of between 130,000 and 150,000 Tibetan refugees who followed him out of Tibet, with another 1,000 to 3,000 entering the community by escaping through the Himalayas annually. China current leadership has chosen enforcement of strict and brutal policies designed to complete the cultural genocide of the Tibetan culture. Given China's rise on the world stage as a social, political and military power, China is not likely to relent any time soon. In order to maintain any support in today's world, the Tibetans will need to continue to create voices for years, if not decades to come. Over the last 5 years, The Tibetan Photo Project, founded by Joe Mickey and Sazzy Varga, has been building the first organized exhibit collection of photos taken by Tibetans living in exile, images of the Dalai Lama, informational texts and rare 1932 pictures of Tibet. 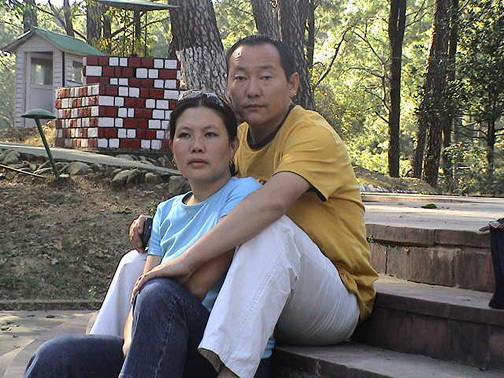 These rare images of life in exile in India are creating at least one Tibetan voice through media coverage of The Tibetan Photo Project exhibits, Website, lectures and now the 2005 DVD production and release of "Voices in Exile" by Tenzin Wangden Andrugtsang. Mickey and Varga met Wangden online about 4 years ago when Mickey was corresponding via e-mail with the office of the Dalai Lama where Wangden worked as a secretary. Mickey asked Wangden if he would take some photographs. "We were treated with portrait masterpieces taken with the disposable cameras given to us by Daniel Carp, CEO of Eastman Kodak" said Mickey. Given the strength of his stills, Mickey asked Wangden if he would be interested in making a film. With an e-mail agreement on a production schedule, Mickey took the role of executive producer with Sazzy Varga as associate producer and Wangden was supplied with a professional level camera, production equipment and an editing bay in India. "As the project progresses, its important to stay true to the mission of The Tibetan Photo Project," says Mickey, "We did not want any Western interference with the content of the film. It was important that 'Voices in Exile' was 110 percent Wangden's design." Wangden created the concept and production was optimistically scheduled for a 6 month schedule. On Nov. 15, 2004, his first short arrived. "Refugee - An Account" was filmed in northern India as Wangden experienced the process of directing, cinematography and editing. The piece has been incorporated into the final cut of "Voices in Exile." In film making, optimism runs ahead of reality. A work-in-progress of "Voices in Exile" was shown at the Centenary which was extremely well received. Despite external pressures, Wangden and Joe agreed, "Voices in Exile" was not a film that could or should have been finished in the US. Together, they decided that this film needed to be finished in the environment where it was filmed. In March, Wangden returned to exile in India and he and Joe set a deadline for the final cut. With his vision intact and inspired by being back with friends and family, Wangden met deadline and the final cut of "Voices in Exile" arrived straight from his heart and his home in exile. "The West has a great deal to learn from the experience of the Tibetan community," said Mickey. "The perspective provided from the modern history of Tibet and China reveals a great deal about the nature of China's future leadership. The lessons have become even more relevant with the rise to power by Hu Jintao, China's former hard-line secretary to Tibet." The combined circulation of publications in print that have told some part of Tibet's tragedy through reporting on The Tibetan Photo Project is approaching 26 million. On the Web, over 1,500 sites link the project. The Tibetan Photo Project has opened the door for some part of Tibet's story to be told on radio stations in Canada, California, Louisiana, Virginia and Colorado and at least one interview is on the Web for pickup. In connection with the Shreveport exhibit, Louisiana Pubic Television produced a polished 4-minute piece that was broadcast statewide. While at work on release and distribution of "Voices in Exile," Mickey is also looking for a new home for the Centenary exhibit. Antioch University, which created an exhibit for its Santa Barbara and Los Angeles campus locations, is opening their exhibit in Ohio in the fall and plans for three other Antioch locations are in the works. "While we donÕt have any money, the Web provides access. That's how we got the exhibits," says Mickey who contacted 300 museums to find a director who would take on the expense of printing and framing an exhibit of 62 of the projectÕs images. Mickey says, "There is a lot of support for Tibet and we set goals and the help seems to find us. The Website is the core of this effort. This project is also a natural for a book publisher, so that is another goal. There will be more films and exhibits. It is crucial to the survival of the Tibetan culture that the Tibetans find new ways to keep telling the world about their tragedy and this effort, in some small way, hopes to add to the continuation of the voice from the Tibetans." 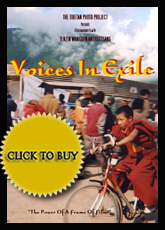 Everytime you forward our e-newsletters, you also help grow this voice from the Tibetan community in exile. Those who can and have donated money, all know how far every penny goes in making this all happen. And because we are not a nonprofit, we know you are giving even when there are no tax benefits. Photo gallery's of Wangden work can be seen at Gallery #13, Gallery # 19, Gallery #13, Gallery #19, Gallery #23, and Gallery #25, as well as in Gallery #34 which has photos from the work in progress screening . We hope you will also enjoy the journal entries on the making of "Voices in Exile" which we documented in The Diary pages.